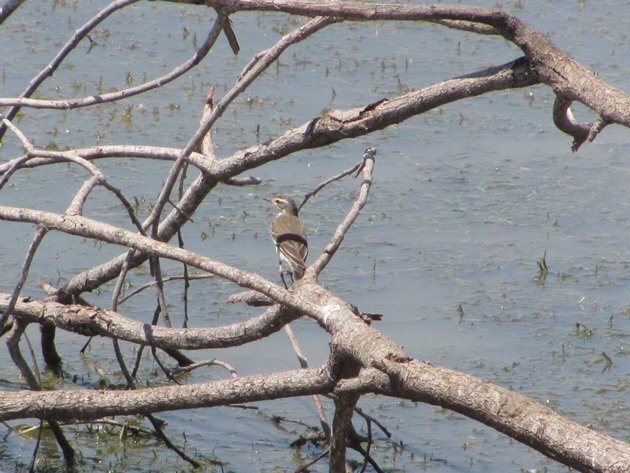 I mentioned a few weeks ago that we had added a branch at Ellendale dam and pleased several species of birds and this is also the case for a branch that we added to a local ephemeral lake. It was also used straight away by a variety of birds and on returning a few weeks later it had become quite a hive of activity. There is no shade at this lake, so we sit in the shade of our vehicle and watch all of the activity. Since we added the branch we position ourselves in that area and watch all of the comings and goings. 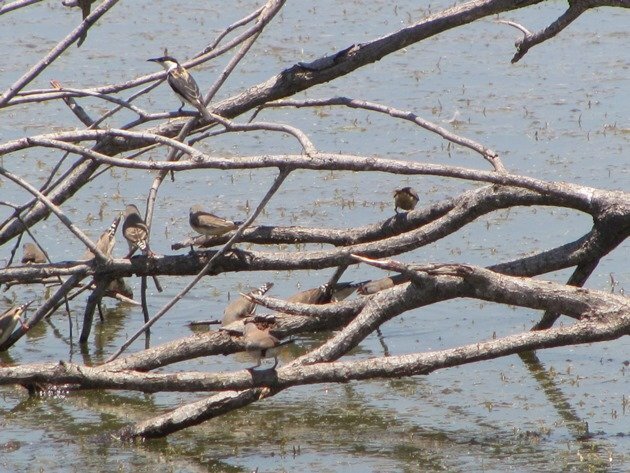 The birds that make the most of the addition are the variety of finches in the area. 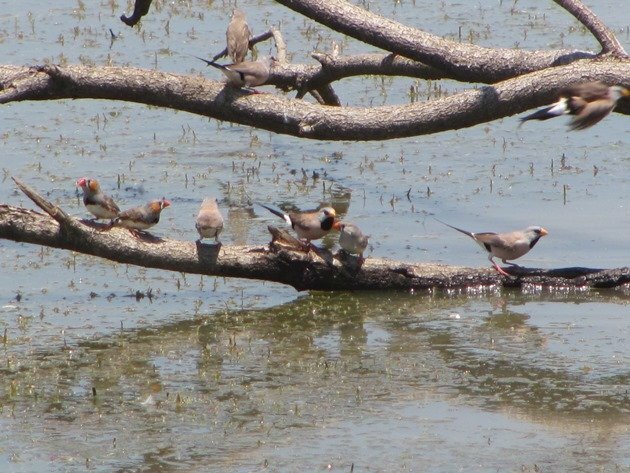 The most common are the Zebra Finch and the Long-tailed Finch and they fly in huge flocks to the water and appear to use the principal that there is safety in numbers! 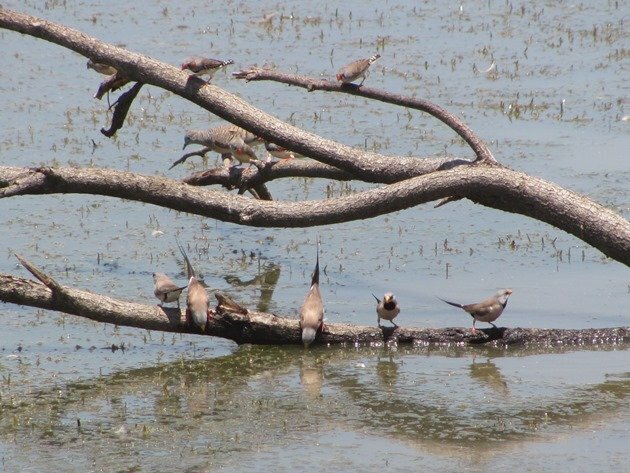 A Diamond Dove soon joined the finches on the branch. 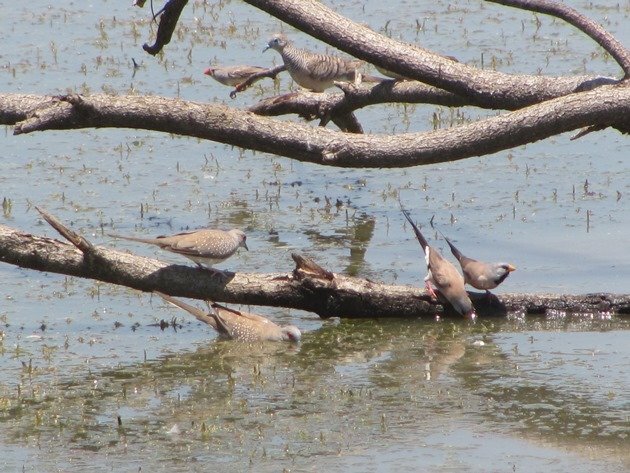 A Peaceful Dove then joined the birds on the branch. 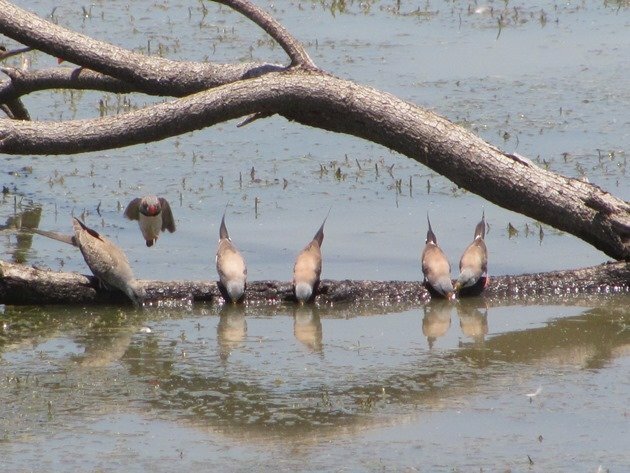 A pair of Diamond Doves with their red eyes and spotty wing feathers flew out to join the finches and one promptly leaped directly into the water to drink! There were very few honeyeaters around, but we were delighted to observe a Banded Honeyeater come onto the branch to drink. 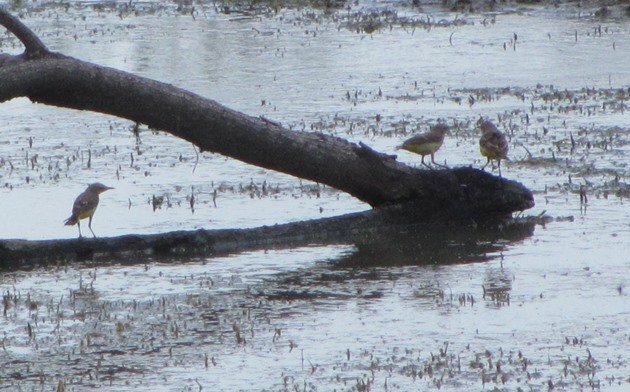 The Eastern Yellow Wagtail also took a liking to the branch and flew over to get a drink using the twigs close to the water. All was going well for the birds and suddenly there was a mass evacuation when a juvenile Brown Goshawk took centre stage on the branch. 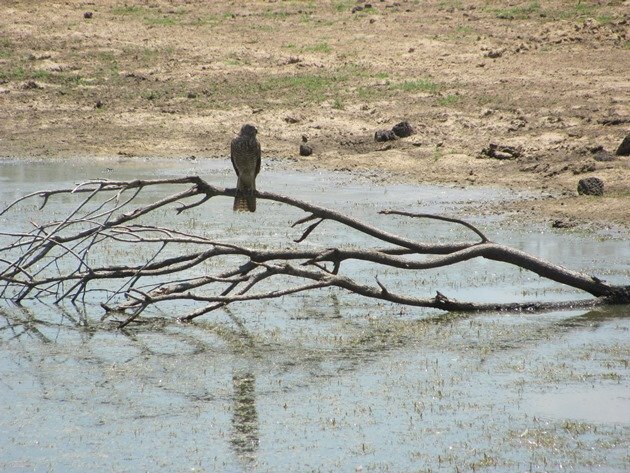 The Brown Goshawk was not looking for food, but like the other birds in need of water. 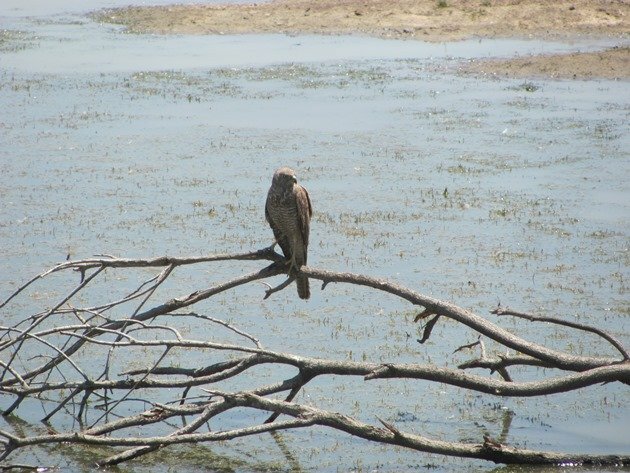 The Brown Goshawk subsequently threw itself into the water and stayed submerged for over thirty minutes. 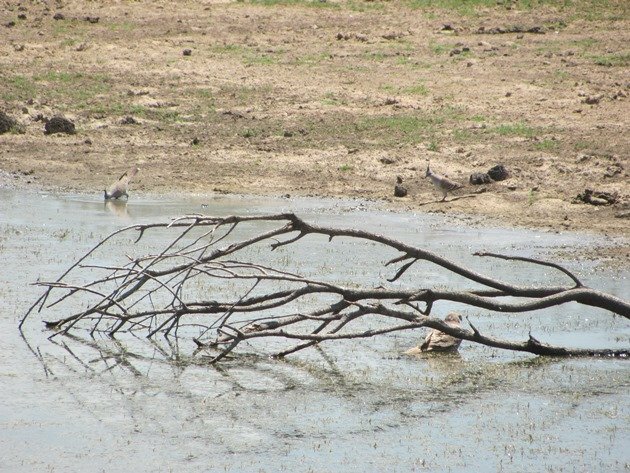 A pair of Crested Pigeons were uncertain about approaching the branch and chose to drink from the edge of the lake. After holding back for over thirty minutes the Zebra Finch decided it was worth the risk, because it was hot and they were thirsty. They flew to the far end of the branch to drink as far from the Brown Goshawk as possible. The biggest disappointment of the day came when it clouded over and the Yellow Chats came to the branch, so you can hardly enjoy the beautiful yellow plumage! 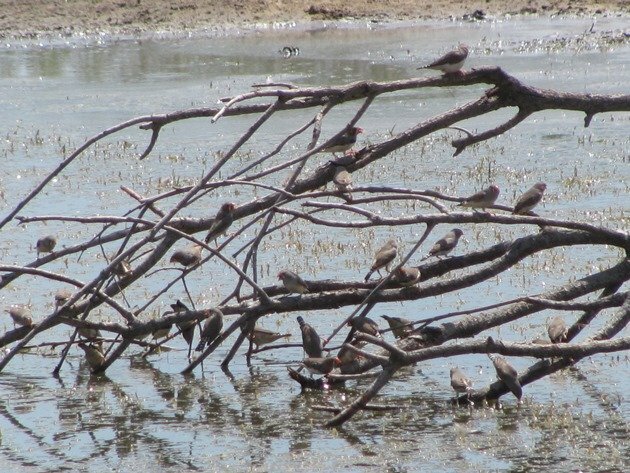 Maybe I have convinced you that a branch is a wonderful thing if you are a bird and you want to get closer to the water! 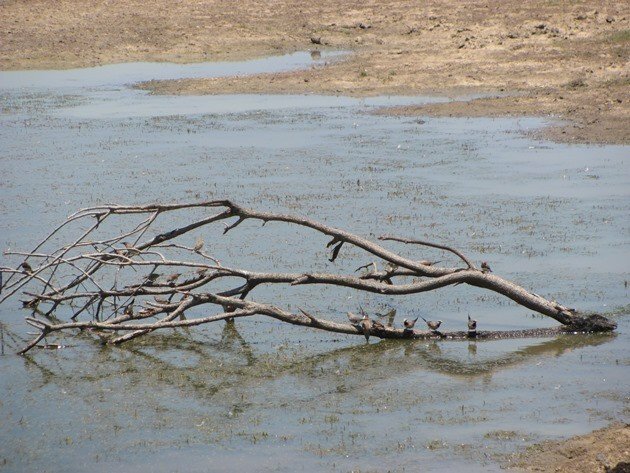 It appears that many species prefer to dip down for water from a dry branch rather than stand on a muddy edge! Muddy edges are for shorebirds! This would make a great picture book! For all ages. Thanks Donna and Dell. We always add branches nowadays! What jumped out at me was how small the Zebra Finch appear compared to the Long-tailed Finch. So I checked my Pizzey and Knight and they are listed at 10cm – Hummingbird size. Do they appear that small in the field? Yes, they are a small finch. 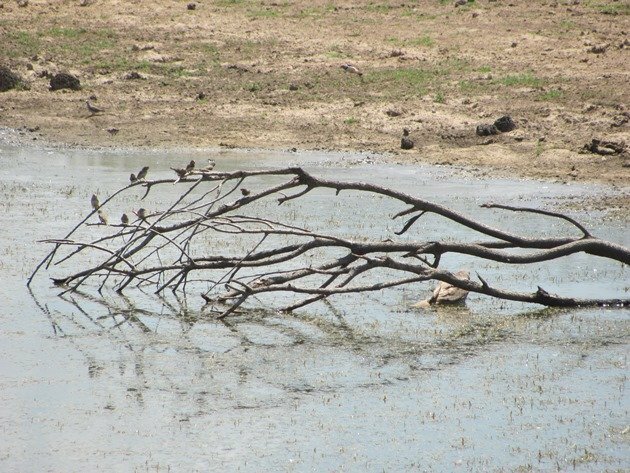 That should serve as resting place and playground for these birds, as well as easy access to water with extra protection against predators.